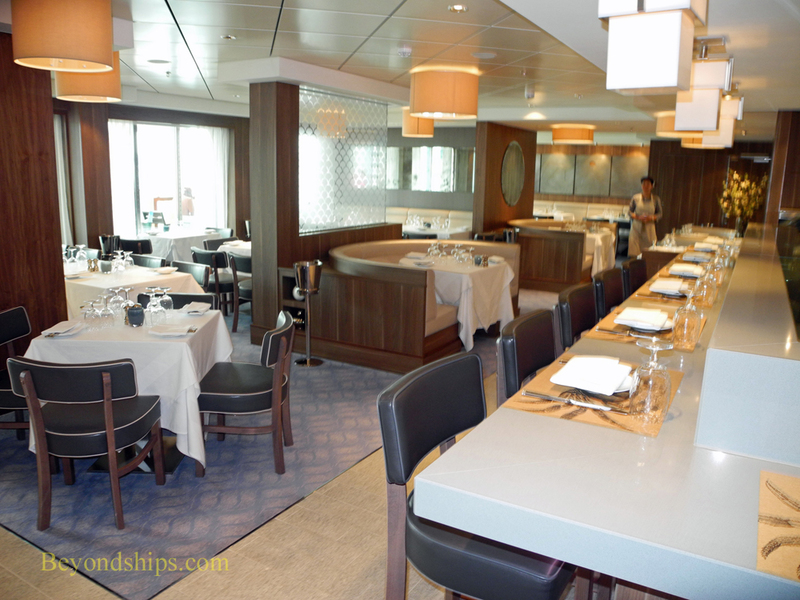 Norwegian Cruise Line has long been a leader in cruise ship specialty restaurants. Moreover, its line-up featuring Le Bistro, Cagney's Steakhouse, Moderno Churrascaria, and La Cucina as well as several other venues is as strong as any in the cruise industry. But with the addition of Ocean Blue to the line-up on Norwegian Breakaway, Norwegian has taken the step from having a line-up that includes some excellent cruise ship specialty restaurants to having one that includes a restaurant that is competitive with any restaurant. To accomplish this, Norwegian has partnered with celebrity chef Geoffrey Zackarian. Chef Zackarian's credentials include having worked at such legendary New York venues as Le Cirque and the 21 Club. He has developed and/or opened successful upmarket restaurants not only in New York but in Atlantic City and Miami. Among his current pursuits are The Lambs Club and the National in New York City. However, he is perhaps more popularly known for winning television's Iron Chef competition and for being a judge on that program. For Breakaway, Chef Zakarain created three concepts. First, the centerpiece restaurant, Ocean Blue, is a sophisticated New York style seafood restaurant. Second, the Raw Bar is a venue featuring shellfish, crustaceans and wines by the glass. The third venue, Ocean Blue on the Waterfront, is a much more casual venue offering seaside favorites. This is not a situation where a celebrity has merely allowed his name to be associated with a venture in exchange for a fee. Chef Zackarian was intimately involved in the planning and development of these venues. The Chef was even involved in selecting the china, the silverware and the décor. He is not in the galley on every cruise preparing each dish. However, Chef Erica who heads up the galley team for these venues has done two tours working with Chef Zakarian in his shoreside kitchens. In addition, Chef Zackarian comes aboard Breakaway every other Sunday when the ship is in New York to work with the staff of these venues. All three venues are located on Deck 8, two indoors, one outdoors. The Raw Bar is just off the central corridor. As the name indicates, it is a bar with tall chairs. Guests eat at the bar. However, it is no diner counter. The light wood paneling, geometric light features and the overall color scheme give it a stylish but unassertive look that is contemporary cosmopolitan. Guests can stop off for a snack or for a light meal of oysters, tartars, lobster etc. From the snack selections on the menu, the Crab Toasts - - Dungeness crab with olive vinaigrette and shaved fennel on toast - - has a strong flavor heightened by its sauce. As a light meal, the Salmon Tartae has a more subtle flavor but with contrasting textures. To accompany the meal, guests can order a glass of wine from a selection of wines chosen by Chef Zakarian. There are also a number of special cocktails exclusive to these venues that are made to recipes from the Chef.